Here's a fun ad from an industry magazine circa 1966, courtesy D.T. Why not wreak havoc on YOUR competition with Gigantor? editors note: this post has been completely revised as of March 2013 to reflect new information. The cute little unicorn Unico first entered my world thanks to a giant poster for the Columbia videocassette release, prominently displayed in the window of the Record Bar at the local mall. VHS, Record Bar, you know we’re talking 1980s here. I was a mopey teen with a jones for Japanimation in any form and the big-eyed anime style was unmistakable, even across the crowded mall. Upon closer examination I noticed the “Tezuka Productions” logo on the poster, which gave Unico an anime world pedigree of the finest caliber. The next week the poster was gone from the window, but a word with the manager and that same poster was mine to take home and haul around for the next few decades. 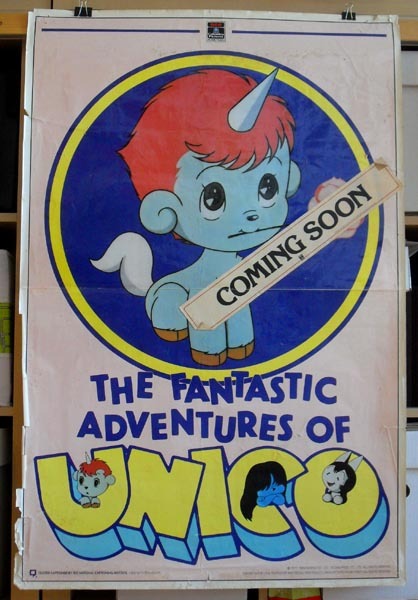 Unico, of course, is a magical blue unicorn whose only desire is to make people happy. This leads to trouble with the powers-that-be, who happen to be gods. Their wrath sends Unico on a never-ending journey via the gentle spirit of the West Wind, and wherever Unico winds up there’s somebody needing to be made happy, so it all kind of works out. First serialized in Sanrio’s magazine “Lyrica”, Osamu Tezuka’s original Unico manga is aimed solidly at children, though not without the occasional touch of a socially relevant or moralistic storyline. A later, even simpler version ran in Shogakkukan’s “First Grader”. Sanrio, having animation experience with films like The Mouse And His Child and the Nietzschean survival saga Ringing Bell, co-produced a Unico pilot film in 1979 as the springboard for a possible TV series. 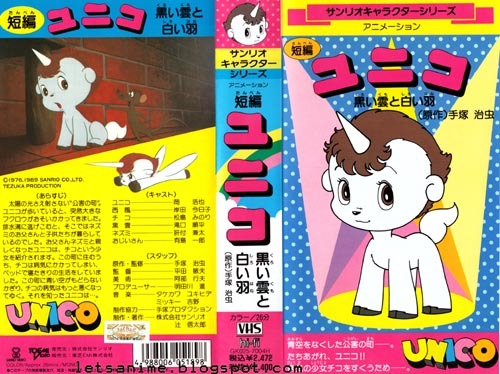 The television show didn’t pan out, but a few years later Sanrio would team up with anime studio Madhouse to produce a Unico feature. Like their previous Ringing Bell, the Unico film is a well-animated and surprisingly dark fantasy, with cute characters and humor countered by ominous and at times threateningly dangerous situations, all lushly rendered and strikingly designed. The followup feature, 1983’s Unico In The Island Of Magic, features Moribi “Lensman” Murano’s angular character designs and the haunting threat of living puppets. 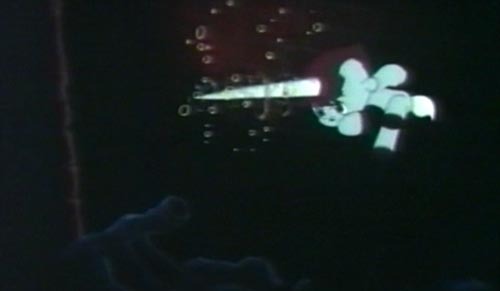 Both Unico features are fully realized motion pictures filled with interesting characters, some of whom are devils and others who turn into teenage girls and are seduced by mysterious barons. When things get scary and/or dangerous, Unico himself turns into a giant adult unicorn, perfectly capable of killing the bad guys. Perhaps Unico is, again, like Ringing Bell, maybe a bit intense for younger children. Regardless, both films received a fairly well-promoted home video release in the United States back in 1984. 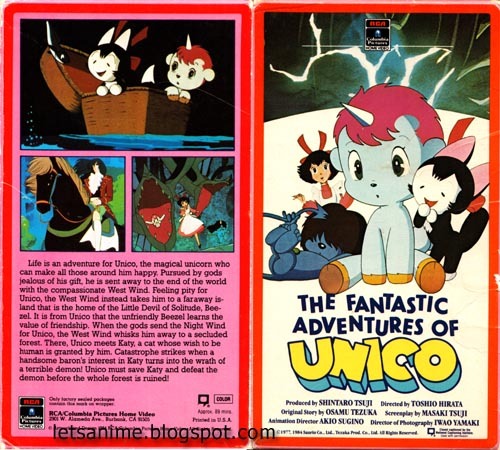 As a staple of the children's video section, Unico and its Magic sequel did journeyman work as video babysitters for the youngsters who would later grow up, become anime fans, and start to remember this crazy thing they saw when they were kids about a little unicorn. 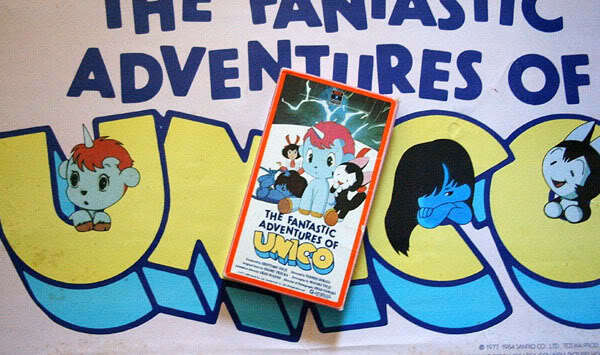 Sadly, for years the only way to see Unico was to dig out your old VHS copy. Vaporware outfit “New Galaxy Anime” announced a DVD release but failed to generate anything but a website. 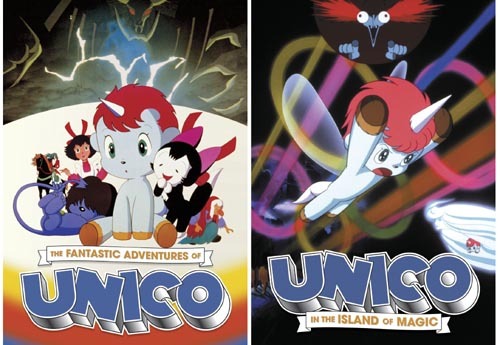 It took Discotek Media to finally return Unico to American audiences with a fine pair of DVDs that feature the Columbia English dubs and the original Japanese language track (with English subtitles). Bringing the story of Unico full circle, the original Tezuka manga was recently released in English by Digital Manga, after a successful Kickstarter fundraising campaign. Has America now reached full Unico saturation? Nope; another short Unico anime film, “Saving Our Fragile Earth,” was produced for the Kyoto Osamu Tezuka World museum. The film is exclusive to the museum, making Kyoto the perfect vacation destination for Unico fans. See you there! All this time I'd been thinking the name of this show was "rampoo", but a more accurate translation is "ranpou". Imaged ganked from I don't know where, some Japanese site. It's a show about Ranpou, a crazy kid who invents things along with his pet mouse and they cause trouble at school. I mean wacky 80s anime crazy, which means laser guns that cut down office buildings, giant cockroaches harrassing teachers, and entire episodes that lampoon Captain Harlock, Nausicaa, Future Boy Conan, and Macross, all in 15 minutes. People ask me what kind of anime I'm looking for, this is it, all I have is crappy copies of 2 episodes, somebody buy me the DVDs for Xmas, okay? If there ARE DVDs, which I doubt. What's interesting about this article is how Frish's Big Boy Restaurants purchased Marine Boy in Ohio, Kentucky, and Florida markets. Was this a promotional tie-in? Did the Big Boy and Marine Boy ever meet in the pages of those free promo comics? Was there a "Marine Boy Surf And Turf" special on the menu? The mind boggles. 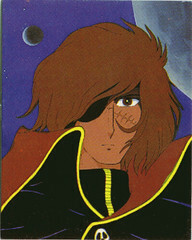 One of the things my pal Matt Murray has done, besides making wacky short films as part of the Corn Pone Flicks filmmaking collective, is set up a comprehensive website all about Leiji Matsumoto's space pirate hero, Captain Harlock. Matt's website covers every anime appearance of Captain Harlock, his spaceship the Arcadia, its crew of willowy girls and potatoheads, the aliens and bureaucrats who try to destroy him, and the various continuities and timelines they all appear in. It also means that I never have to write about Captain Harlock on this blog, I can just point everybody to Matt's website. For instance, didja know that Harlock's pal Tochiro, the guy who built the Arcadia, has at least three separate, completely different animated death scenes? That there are two Arcadias? That most of Harlock's animated appearances completely contradict each other? It's this kind of incongruity that keeps Matsumoto's work fresh and gives scholars things to argue about for years and years. So do yourself a favor and check out Matt's Harlock website, if only to learn about "Malibu Graphis" (sic) and their amazingly bad late 80s Harlock video release. Tell 'em Dave sent you!